For seven years, Abdur Khan has been calling the makeshift camp, a thatched one room on an embankment, his home. A resident of Assam’s Balimukh village in Morigaon district, he moved out of his village along with his wife and two children. “We were a prosperous farming family with 9.6 hectares (ha) of cultivable land, a power tiller and a house. Today, I work as a daily labourer,” says Khan. The land that Khan owned started to degrade during the floods in 1998. “We never thought that the entire land will be degraded. But the Brahmaputra completely engulfed our land during the 2007 floods,” he says, his voice choked with emotion. Khan is not alone. State government data shows over 150,000 families have been displaced in the past decade due to soil erosion in the state, and 37,000 of the families have been rendered homeless in the past five years. About 100 families live along with Khan. With each flood and with every bit of land eroded, new camps are fast cropping up. The state government doesn’t keep record of them as these are not official camps. These people don’t even have basic amenities. “You can call it a life sans any recognition,” says Khan. There are hundreds of such camps across the mighty Brahmaputra and several other rivers in the state. Currently, the state is facing one of its worst floods in recent decades. Some three million people have been affected in 80 per cent of the state by floods in the last six months. Floods are not new, and land erosion is a recognised problem in the state. Assam loses 8,000 ha of land to rivers like the Brahmaputra and the Barak and their tributaries every year (see ‘Eroded’). The width of river Brahmaputra has increased by up to 15 km at some places due to bank erosion. According to experts, though Assam has always been vulnerable to floods, the Great Earthquake of 1950 led to massive changes fostering erosion. “The river became more unstable after the earthquake and the shifting of channels and erosion became more severe and frequent,” says Parthajyoti Das of Aaranyak, a Guwahati-based organisation working on environment. However, in a criminal interpretation of government provisions, the state government refuses to take up rehabilitation of erosion-induced displaced people. By law, flood is recognised as a natural calamity, thus qualifying for relief and rehabilitation. But, the resulting soil erosion is not treated as a calamity. The government has not set up even a single relief camp till date for the erosion-affected families. The displaced people set up their own camps. 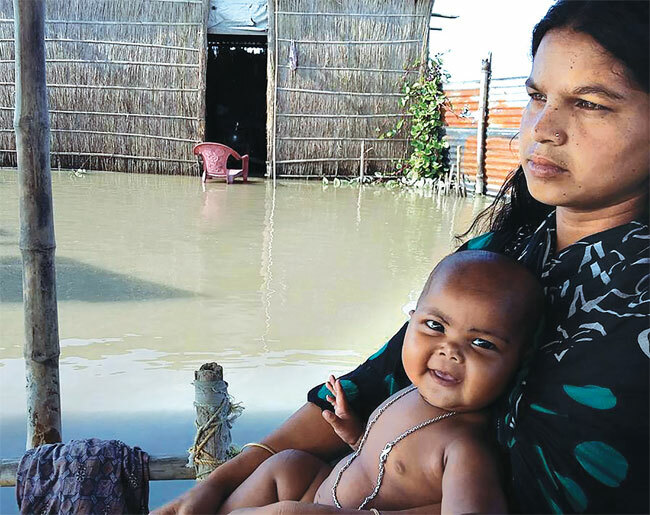 A 2014 study, Disaster recovery and resilience: Case study of Assam floods, by Sneha Krishnan, a PhD candidate at University College, London, says government assistance is only limited to immediate relief as long as families are living in state-run flood camps. Such camps are temporary and for those who can come back to homes after the flood recedes. “It is not only the state, even humanitarian agencies were not forthcoming to support or assist—as many considered erosion to be a chronic problem,” says the report. However, the state government is aware of the ever-expanding unofficial camps. Assam Revenue Minister Bhumidhar Barman told Down To Earth that there should be around 30,000 makeshift camps in the state where erosion-affected people are staying. “We do not have comprehensive data because the camps have been set up by the people and not by the state government,” he adds. The actual figure could be much higher, say experts. “There are close to 100,000 erosion-affected people in Dhemaji, Morigaon, Tinsukia and Dibrugarh districts alone,” says Sosi Bordoloi of Women Development Centre, a non-profit based in Guwahati. This year, the population of the unofficial camps is set to swell due to the current floods. “The flood has been very severe, and several new areas have been flooded,” says Basanta Das, Assam’s water resource minister. “Over 1.6 million people residing in 2,000 villages have been affected this year. More than 226,000 people displaced by floods have been shifted to relief camps across Assam,” says Das. But, will these people come back to their homes? State officials say several villages have been completely swallowed by the Brahmaputra this year. For example, nothing remains of Mikirgaon and Jotiapur villages in Morigaon district. This means that these people will scavenge every possible vacant land and settle in makeshift shelters. Soon nobody will recognise them. The 230-odd families who were residing in these two villages have now set up camps on embankments nearby. Mikirgaon resident Purnakanta Basumatary says he has lost everything to the floods. The 56-year-old farmer says he had a big house and a comfortable living. All that remains of his belongings is a car that is parked outside the camp. “I do not know what the future holds for us. All that I had earned in my lifetime has been reduced to nothing,” he says. “We have no other option but to wait here, as we have lost all our land with no government help in sight. The best option for us is to make the embankment our new home,” says 45-year-old Jishu Hazarika, who recently shifted along with his wife and two children. The unofficial camps may also soon crumble. 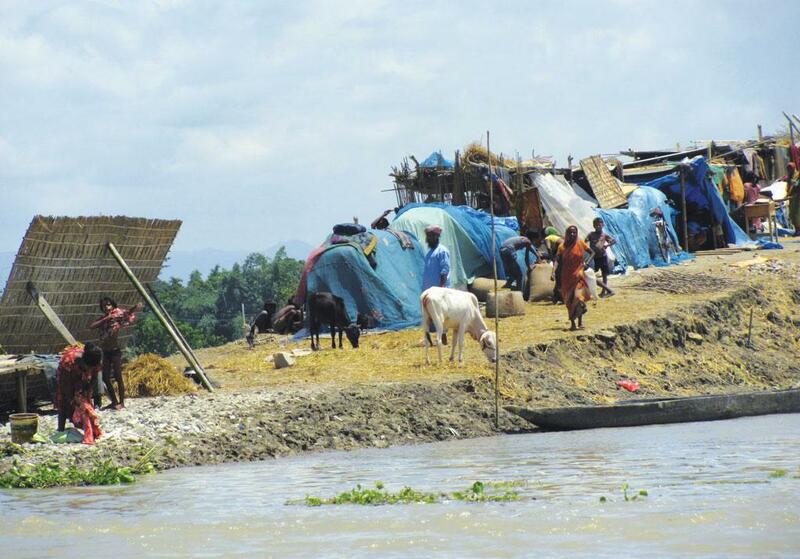 Most of these camps are located on embankments constructed to hold back water from rivers. Experts warn that most of these embankments are old and now highly prone to breaches. “There are a total of 449 embankments in Assam covering an area of about 4,350 km. The state water resource department has identified 950 km of these embankments as extremely vulnerable and about 2,390 km embankments as vulnerable to flood and erosion,” says Luit Goswami of Rural Volunteer Centre, a non-profit based in the flood ravaged district of Dhemaji. Former Assam Water Resource Minister Bharat Chandra Narah says most embankments and other flood protection measures had overshot their effectiveness period. “Most of the embankments along the Brahmaputra and its tributaries were constructed between 1965 and 1995, and they have already crossed their period of effectiveness,” Narah adds. Goswami says the life span of an embankment is not more than 20 years, but most of the embankments in the state are over 45 years old. “The embankments have weakened and are not able to withstand the high thrust of floods,” he says. Families living in the camps know about the threat, but they say they have nowhere else to go. “In their local history, many embankments have been washed away in the past 20-30 years. In recent years, the embankments could hold for only one or two years. In Morigaon in 2013, the newly-built embankment was breached and villages were inundated. The communities were concerned that the delineation of embankment layout happened without relocation and resettlement plans of the government in place,” says the 2014 report. This March, the state government took the first step towards recognising these camps. It declared a special scheme in the chief minister’s name to rehabilitate erosion affected families. “The government has allocated Rs.5 crore in the current year’s budget for the scheme,” says Bhumidhar Barman, Assam’s revenue and disaster management minister. The implementation of the scheme will take time as the first big challenge for the government is to identify the camps. “As per the information received from 15 districts, some landless people affected by erosion are now living in other parts. Some are living on embankments and on roadside, while others are living on leased land,” he says. In these 15 districts, 880 villages eroded completely and 67 villages were eroded partially. The state has to search for these people. Acknowledging the problem of erosion is the first logical step, say experts. This will enable the state government to start investing for the rehabilitation of the families. The state government has so far failed to utilise its disaster fund. “The Assam government has Rs.1,425.45 crore under the State Disaster Response Fund, which is yet to be utilised,” says Sarbananada Sonowal, Union sports minister and MP from Assam. The next step, say experts, has to be towards mitigation to reduce erosion. The 2011 Committee for Developing Mitigation Strategies for Brahmaputra River Basin Flood and Erosion Problem, which had experts from Assam and the US, found the key reasons for erosion were “aggradation” (raising of the river bed due to sediment deposition), intense “braiding” and large water discharge. The committee suggested a combination of measures including strategic dredging, protection of erodible bank materials with anchored bulkhead or tie back sheet piles, spurs, toe and bank revetments. It also suggested improvement of data quality and quantity by extending rain, flow and sediment monitoring network using state-of-the-art equipment and considering physical modelling to study severe and potential scour sites. Meanwhile, the displaced families continue to live under the fear of eviction. They also live in the hope that their leaders will soon provide them with land for rehabilitation. “Leaders from all political parties visit us before each elections, be it the Lok Sabha, the state Assembly or the Panchayat elections. They pay us Rs.100-500 and assure us that we will get land soon. Most of us are hoping that the leaders will deliver on their promises,” says Rahim Ali, who lives next to Khan in the camp at Balimukh village. This is a strong piece journalistically and deserves all the coverage it can get. So when and where's the State Government's response to be seen ?